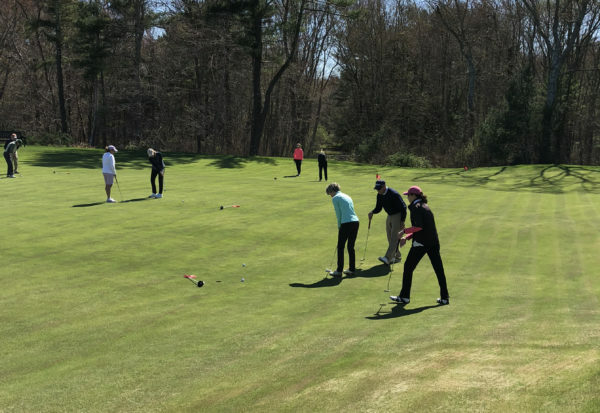 Each spring, Bay Club Director of Golf, Greg Yeomans and Fitness Manager, Matt Beatty team up to offer members a “Golf and Fitness Spring Training” program. The class series generally begins mid- to late-April and includes multiple sessions for golfers and fitness enthusiasts of all abilities. The primary goal is for the members to get their body and game ready for the golf season. Combining golf and fitness into one program allows golfers to enjoy the benefits of stretching, fitness and instruction on the way to improving their golf game. The classes are primarily group-based with limited one-on-one coaching. Weather permitting, the typical schedule is an hour of fitness, followed by an hour of golf instruction for nine sessions. 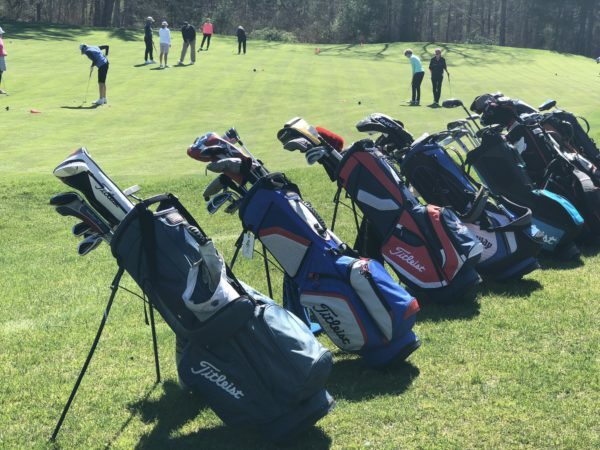 Members enjoy this program each spring, with many returning year after year to dust off those clubs and work on strengthening their game for the coming summer. 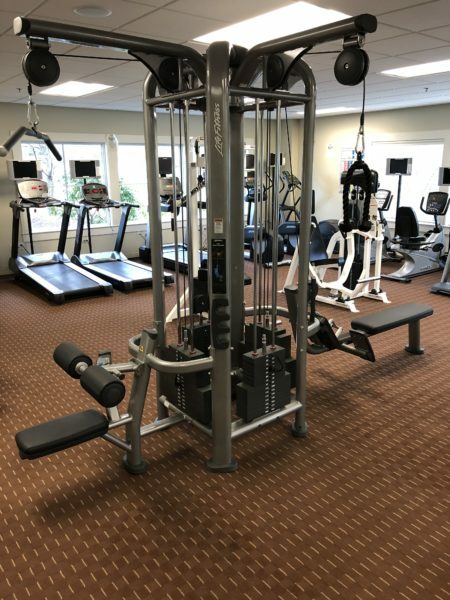 The Bay Club recently added some new Life Fitness cardio and strength equipment to the state-of-the-art Fitness Center. 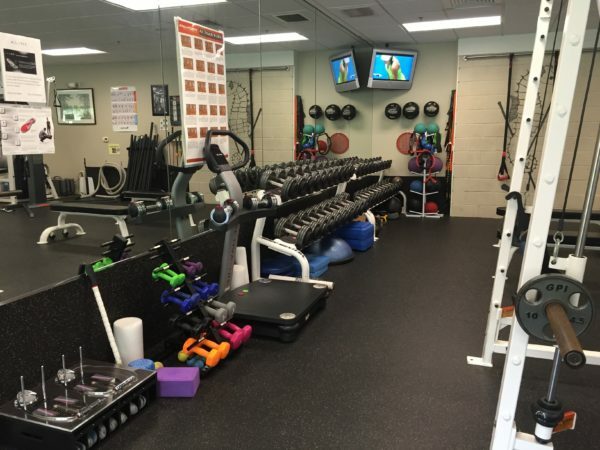 The new Ellipticals, Treadmills and MJ4 have seen a great deal of use by the membership. The MJ4 is a multi-faceted piece of equipment that enables four members to train simultaneously with exercises including lat pull-down, tricep extension and seated row. Bay Club Fitness Trainer, Matt Beatty suggests these particular exercises for golfers and tennis enthusiasts alike to help strengthen the upper body. The lat pull-down is a strength training exercise to develop the latissimus dorsi, rhomboid and trapezius muscles. It performs the functions of downward rotation and depression of the scapulae, combined with adduction and extension of the shoulder joint. This is a great exercise for posture and upper body strength. The tricep extension, an isolation exercise, targets one muscle group with movement occurring at only one joint. This allows exercisers to focus efforts on just the tricep muscle. Other exercises work the triceps as secondary muscles, such as the chest press or push-up. For beginners, the seated row develops muscles of the back and forearms. It is an excellent all-round compound exercise for developing the middle back while offering useful arm work as well. And lastly, the seated cable row works the back muscles in general, particularly the latissimus dorsi. This pulling exercise also works the forearm and upper arm muscles, as the biceps and triceps are dynamic stabilizers for this exercise. The hamstrings and gluteus maximus, also stabilizing muscles, come into play with this exercise as well. 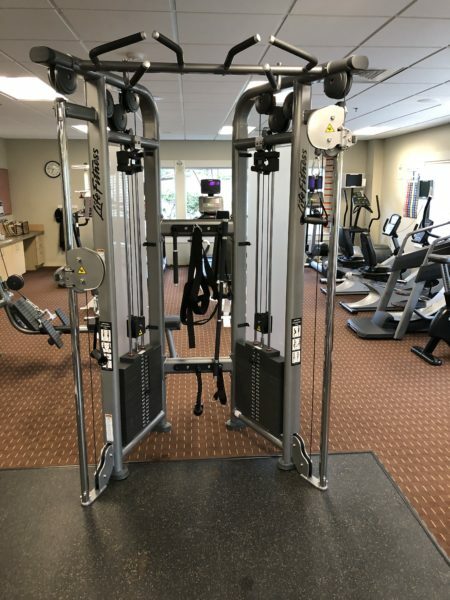 Activity levels at the Fitness Center are a good indicator that the new equipment has been met with great enthusiasm from members looking to up their fitness game. 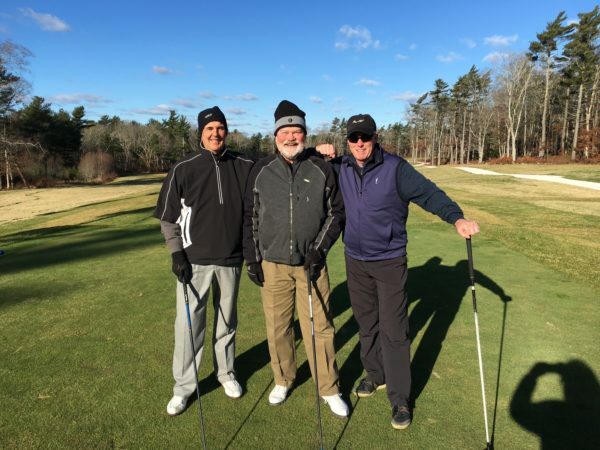 Winter is officially here in New England, which for some golfers is a time to head south to warmer temperatures. However, for those who remain here, it’s important to stay in shape during the off season to keep your golf game in tip-top shape. Bay Club Fitness Trainer, Matt Beatty shares a few exercises golfers can incorporate into their gym routines to help stay in peak physical condition during these winter months. Yoga is a great exercise option for golfers as it helps with flexibility and core stability. It also helps to lengthen muscles to improve the range of motion. These qualities can aid in creating a stronger swing. Yoga can be especially helpful for senior golfers since flexibility tends to decrease as we age. Golf uses many muscles in the body and is considered a “burst sport;” generating a lot of energy in a short period, followed by a period of rest. Enter HIIT! During interval training, you work at high intensities followed by lower intensities. Applying HIIT elements to your workout can be as simple as adding bursts of energy during your normal cardio routine at a 1:2 (work:rest) ratio. You can also perform more complex moves such as mountain climbers, plank jacks, burpees or high knees. Resistance and weight training can be particularly valuable to golfers by improving stability and range of motion, as well as helping to create a powerful, more controlled swing. Keeping active and fit is so important this time of year to make sure you’re ready for golf in the spring! This fall, Bay Club Sports and Activities Center Manager and Fitness Trainer, Matt Beatty put together monthly fitness challenges for the membership. Members are able to complete these challenges in the Fitness Center with oversight by the staff or on their own in the comforts of home. Each challenge provides a calendar of daily exercises, with occasional “rest” days throughout the month. 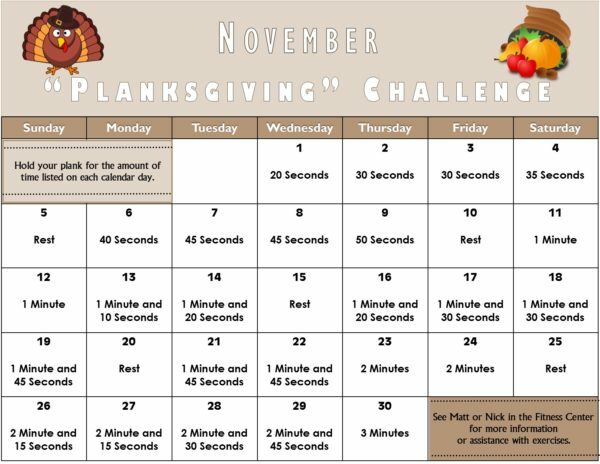 Currently, members and employees are planking away for the November “Planks-giving” challenge. The purpose is to gradually increase plank times throughout the month culminating with a three-minute hold. And Matt is keeping the competitive spirit alive with a leaderboard displaying the various times for all participants. While the calendar is just a guide, especially for a plank newbie, many participants are no stranger to the exercise and have already exceeded that three-minute goal. Matt suggests that beginners start off slowly and to focus on correct form as opposed to time. A well-performed plank for a shorter period of time is better than risking injury with improper form for a longer plank. 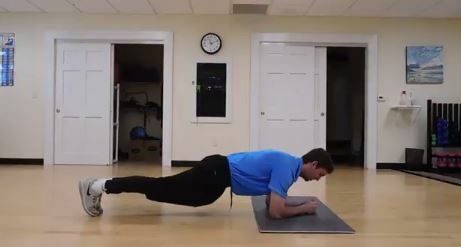 Done properly, planks are a great exercise for the core. They engage multiple muscle groups simultaneously, help to improve balance and also aid in reducing lower back pain. Last month, Matt’s Fitness Challenge tested participants’ upper body strength, and with December approaching, members and employees can be sure something interesting is in the works! There isn’t much that can be said about fall in New England that hasn’t already been said. It’s a beautiful time of year, both with the weather and picturesque landscapes. The humidity that is known to rear its head in the summer is almost non-existent. The cool nights lend themselves to brisk mornings that lead into warmth during the day. It’s generally not as dry, so the grass that has been burnt to a crisp in the heat and drought becomes green again. And of course, the popular fall foliage that people love to flock to emerges. While much of the hustle and bustle of the summer months winds down after Labor Day, the Club certainly does not shut down. There are still many activities on our calendar for members to enjoy through the end of the year. 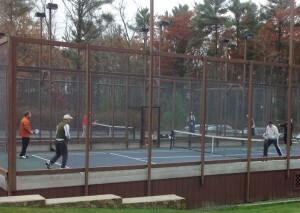 With the cooler temperatures, fall may just be the best season for tennis. 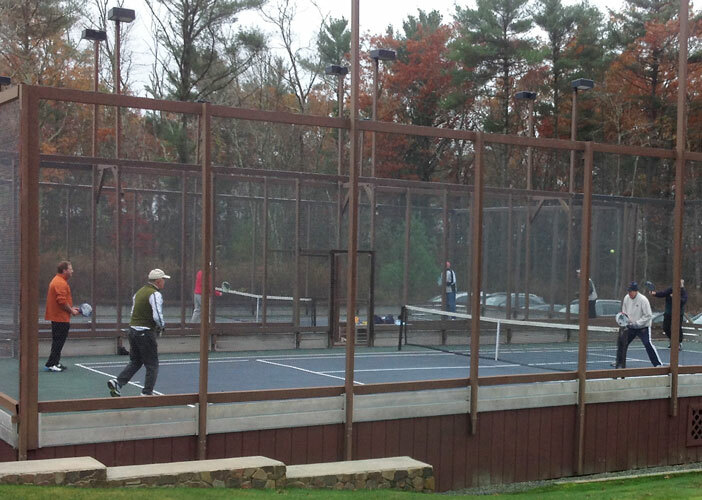 Clinics and Drop-ins still are popular this time of year, and even though the days get shorter, the lights on the courts make it possible to play in the evenings. And of course, Paddle begins again and goes through the winter. Fall is a great time for golf despite the shortening of days. 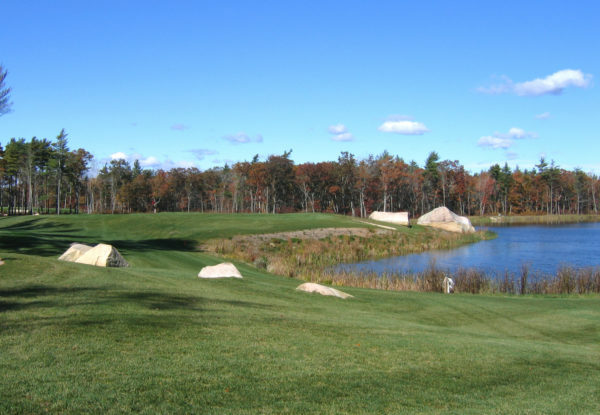 Scenic foliage along the perimeter of the course, comfortable weather, less crowds…the list goes on. Just be sure to layer up on those cool mornings! Cultural Activities and Special Events at the Club tend to be more abundant after the busy summer season. The Canasta group continues throughout the year, meeting at the Golf House each week. Lectures given by members and visitors are more frequent and Book Club returns from October through May. The Fitness team at the Bay Club is here year round to help keep members in shape throughout the fall and winter months. New group classes are available as well as personal training sessions. Our fitness staff is always eager and willing to help any gym newcomers get started. There is something for all members to enjoy this beautiful time of year at the Bay Club! 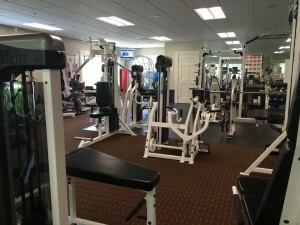 Summer’s almost over, however that does not mean the members at the Bay Club will be giving up on the gym! The fitness gurus at the Bay Club plan to keep members in tiptop shape this Fall with new classes aimed at helping them keep fit year-round. Fitness Director Dave Maloney will help members learn to utilize their Fitbit, Garmin or other fitness tracking devices to their full potential. Dave will use heart rate training techniques and teach how to burn the maximum number of calories each day. In addition, Fitness Associate Matt Beatty will lead new classes this fall with all fitness levels in mind. His High Intensity Interval Training class will focus on cardio and muscle toning utilizing fast power movements such as jump squats, mountain climbers, pushups and more. Matt will also conduct a less intense Fitness FUNdamentals class of both aerobic and anaerobic exercises for burning maximum calories. Members will be put through a whole body workout, focusing on muscle endurance and strength. Matt’s goal is to get members of all fitness levels involved with the Bay Club’s state of the art training facility. Both Dave and Matt are also busy with personal training sessions as well. Whether members are starting their fitness journey, looking to torch calories, or trying figure out how to get their fitness tracker to work in their favor, members have many reasons to stop by the Fitness Center this fall. Bay Club Fitness Director, Dave Maloney CSCS recently earned his Level II Junior Coach Certification from the Titleist Performance Institute (TPI). The Titleist Performance Institute began in 2003 and is the world’s leading educational organization and research facility dedicated to the study of how the human body functions in relation to the golf swing. The TPI Junior Golf Development program is focused on teaching professionals the skills needed to run a successful junior golf program. Based on Long Term Athletic Development principles, it is a step by step approach in helping juniors to become elite athletes and golfers. The program focuses on developing athletic skills before any golf specific skills. Golf skills are more easily learned with developed athletic coordination. Dave looks forward to implementing this philosophy with junior golfers at the Bay Club this summer. Cardiovascular disease kills more people each year than cancer, lower respiratory diseases and accidents. Cigarette smokers are two to three times more likely to die from coronary heart disease than nonsmokers. Heart disease killed 631,636 people in 2006. So what can you do to protect yourself from heart disease? While there are some risk factors you can’t control, such as age, gender, heredity, race and diabetes, there are risk factors for heart disease you CAN control, like high cholesterol, high blood pressure, smoking, exercise, obesity and stress. By eating a healthy diet that includes plenty of fresh fruits and vegetables and exercising regularly for at least 30 minutes each day, you can do wonders for your heart. Determine whether or not your weight is within a healthy range, don’t smoke and limit how much alcohol you drink. You should also talk with your health care provider about your heart care. Talk to him or her about monitoring your blood pressure, testing your cholesterol levels and regularly monitoring your blood sugar levels if you have diabetes. How can I be ready for the new season when there is snow on the ground? With the arrival of winter, Head Golf Professional Greg Yeomans offers members some tips to prepare for the 2014 golf season without playing any rounds. The first suggestion is to do lots of stretching. 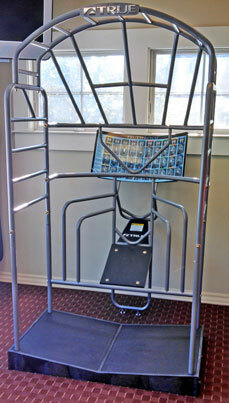 This can be done utilizing the TRUE Stretch offered at the Fitness Center. Once we stop certain activities such as golfing on a regular basis, we get tight and our swing can become restrictive or too short. This can lead to timing and swing flaws. Because I don’t play from November through March, I make sure I stay loose by doing stretches. In addition, members are able to practice their swing at the Indoor Golf Center located onsite in the Cart Barn. 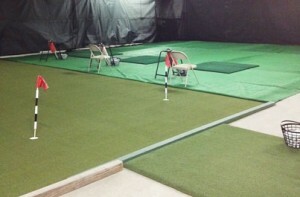 The hitting bays and simulator create a perfect environment to work on your fundamentals. Whether you need to make a grip change, improve your posture or fix your swing path, utilizing the simulator can help you achieve all of these goals. The worst thing you can do is to be sedentary. Greg suggests you stay loose by stretching and if nothing else, hitting some balls to maintain your timing and rhythm so you are ready to start the new season. And if you need some professional advice, Fitness Director Dave Maloney at the Fitness Center or Greg Yeomans at the Golf Pro Shop are happy to arrange a private appointment and work with you to keep you flexible and in shape during the winter months. Each month, Dave Maloney, Bay Club Fitness Director and Head Personal Trainer shares a different exercise tip with members. To view his exercise channel, please click here. Dave is a Titleist Certified Golf Fitness Instructor, and performs the most comprehensive Golf Performance Assessment in New England. This certification allows him to design custom exercise programs to correct swing faults and to prevent/treat golf swing injuries. 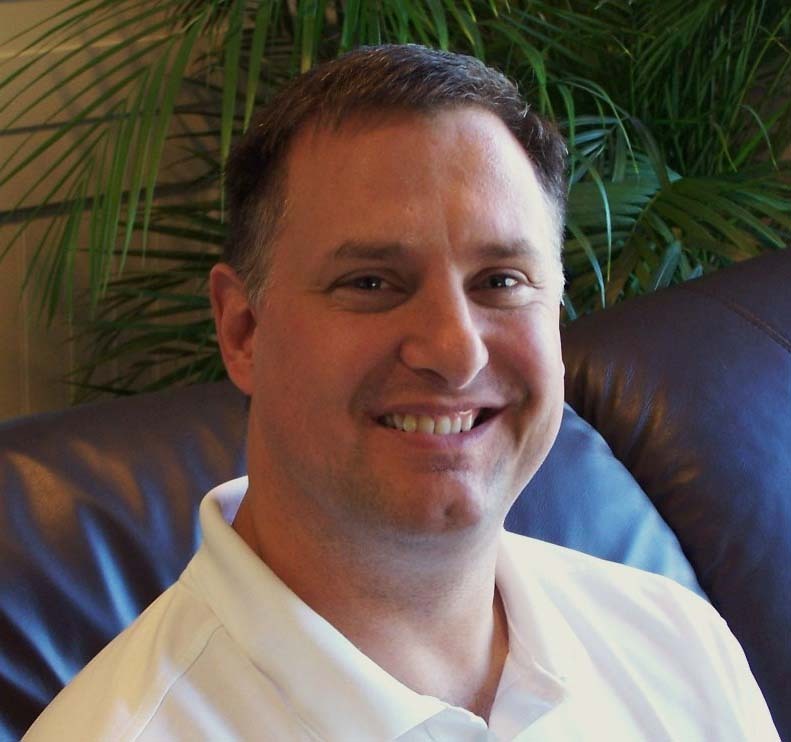 Dave has performed well over 200 Golf Performance Assessments since becoming a TPI Instructor and is able to assess what swing characteristics the client will have before he even sees them pick up a golf club. Fitness Director Dave Maloney has recently added certification Â in â€œThe Burdenko Methodâ€ to his resume.Â This practical application of water and land exercises is based on a holistic approach to rehabilitation, conditioning, and training.Â Water is a great healer and the ideal medium for rehabilitation, conditioning and training. Â The hydrostatic (passive) and hydrodynamic (active) properties of water provide an optimal environment for safe and effective therapy and conditioning. Â With little or no weight bearing in the water, the injured or de-conditioned client is able to return to desired activities quickly and safely. Â Dave’s first hand success with “The Burdenko Method” after suffering a sprained knee inspired him to add this specialty to his list of credentials. Â “After the first hour in the deep water, I was amazed at how significantly the swelling and range of motion improved” Dave recounted. Many professional and Olympic athletes are now making “The Burdenko Method” part of their regular training programs, although itÂ is for everyone. Â If you are dealing with a nagging injury or just want some great exercises that are easy on your joints, Dave suggests you give this program a try. The Burdenko Method will be offered on a private and semi-private basis. Â Land based exercise programs have been added to the Bay Club’s Fitness Class schedule for the winter. Â In addition, water based programs will be offered when the junior Olympic-size swimming poolÂ opens in the summer. 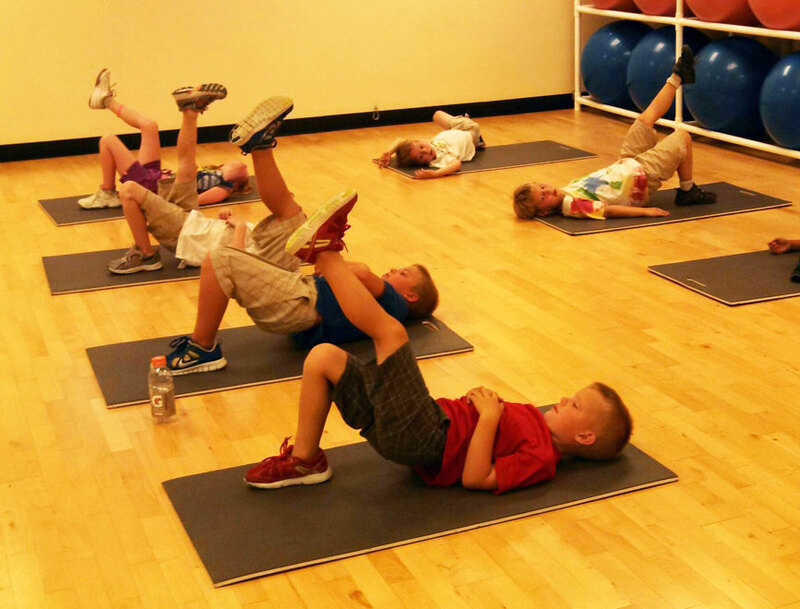 Fitness Director, Dave Maloney offers members new fitness exercises each month. Â These exercises are geared towards improving their overall strength and lowering their golf scores. Â This month’s exercise â€œThoracic Spine Rotationâ€ can be viewed by clicking here.